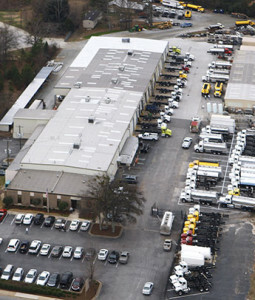 Bulk lubricant trucks are available in a variety of options. All of the models that are used for delivering refined fuels are also available for bulk oil delivery vehicles. We have the capability to design and produce units that have dedicated lines and special filtration to eliminate product convergence or “co-mingling” in order to maintain the high quality “spec” of today’s advanced lubricants. Our equipment designs and layout reduce the amount of times the operator must climb in the back of the truck throughout the day. 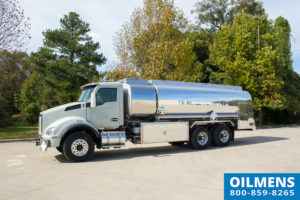 In addition to our standard tank wagon options, we offer two specialty model tankers – the LubeMaster™ and the LubeAll™. This unit is a combination of storage space in the rear (used for carrying drums, totes, or dry goods) and a compartmentalized truck tank in the front. The cargo space is accessed via a roll up rear door and this unique design offers dock height loading or ground level access via liftgate loading. The Lube All™ tanker offers similar capabilities to the LubeMaster but the rear compartment is accessed through a pneumatically operated “clamshell” style lid with a hydraulic liftgate. At the flip of a switch the entire rear cover rises to provide access to the 7′ clear height cargo area. When closed, the cargo section is weather tight.Dual pumps, meters, and reels are all accessed from the same side for easy delivery. Drums, pallets, or totes can be loaded at the dock or using the liftgate.The rear cargo area can hold up to (6) 55 gallon drums and (3) 120# drums or numerous cases of dry goods. It can also carry tote tanks. The cargo area is equipped with diamond-plate floor, (2) rows of E-track and wooden protection at two levels. A 2” suction hose to one of the bulk pumps gives the flexibility to pump out the drums. We also offer Lube Vans and Trailers for the delivery of bulk lubricants and DEF (Diesel Exhaust Fluid).